This hotel boasts a beachfront setting, lying just a short distance away from Split. The hotel is located just a short distance away from the centre, while the commercial and tourist area of Dalmatia is situated just 10 km away. The hotel is situated in Podstrana, lying within easy access of a host of attractions in the area. 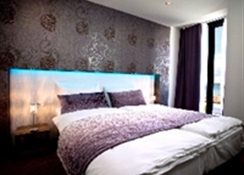 This hotel enjoys a delightful design, beautifully incorporating traditional and contemporary styles. The guest rooms are elegantly designed, oozing character and charm. Guests can relax and unwind in the stylish lounge bar, or enjoy a leisurely swim in the pool. Guests can partake in a vigorous workout in the fitness area, followed by relaxation in the sauna. Newly built, with direct sea view and equipped with modern facilities, which will meet the needs of both business people and guests who primarily come to rest in Podstrana. Relax and enjoy the stylish lounge bar by the pool. In addition we offer to our guest's the use of car parking, fast ADSL internet, indoor pool, sauna and fitness.